It's been a fantastic several months of awesome DLC for Max Payne 3 and it's finally coming to a close. This should be the last DLC for this awesome game, and it's going out with a bang! 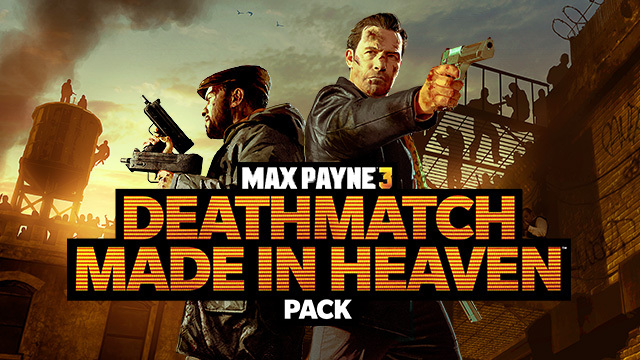 Deathmatch made in Heaven DLC pack.. Coming with Co-op and Competitive modes! Co-op! This will be first Co-op mode offered by Max Payne 3 and I'm pumped! It's going to be exciting. Always thought the story set itself up nicely for some good old co-op with Max and Passos. The single player had some fine moments with Passos rolling with Max as they deliver "Payne" to all the thugs. I thought that it would be great if we can have some co-op with us controlling this "Army of Two". So hopefully this co-op modes offered in the latest DLC will make my dream come true. The artwork released along with this comment on Rockstar's official site.. "but as you can see in the pack’s official artwork above, Max and Passos will no doubt have their hands full…"
Hmm.. makes me guess if it's going to be some kind of "horde" mode with all those thugs hovering above. Of course other modes like replaying the single player missions in co-op will also be welcome. The DLC will be released next week on Jan 22 and more details will be released soon..
All I need is a co-op partner now.. Anyone? I can be Passos if you want.. haha!